Let me start by saying I’m the Queen of foot problems. My Podiatrist loves me. So, 90 percent of the time, you will find me in flip flops. Now, most flip flops are actually not very good for your feet…color me shocked! In fact, they are probably the worst things you can wear because the flop flops I grew up with totally lacked support. Nowadays, that’s not the case. You can find flip flops that give some support. I have a few pair of expensive Vionic Orthoheels, but, like I said, they are expensive. Also, the ones I have don’t really have a foot bed that feels very “cushiony” to me. They do serve their purpose though and they do have a very good arch support. I occasionally scroll around on Facebook. Okay…..I’m on Facebook a lot! If you’re on Facebook, then you know there are those irritating ads all over your newsfeed. Well, one ad had a really cute pair of flip flops showing, so…..I clicked on it. 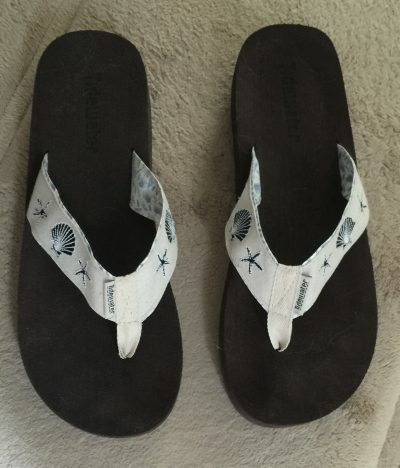 I’m now the proud owner of Linen Shell Flip Flops by Tidewater. These flip flops are like walking on a cloud. They are soft, cushiony and most of all cute, fashionable and reasonably priced! They do have an arch support. It’s not a huge one but it’s there and it does help. Much better than walking on a flat, archless flip flop. As it states on their website, the Tidewater’s tend to run a size small and they are not kidding. I wear a perfect size 9 and that’s what I originally ordered. I had to return them for a perfect size 10, which fits like a normal 9. So size up. But you won’t regret buying these. The only downside I can mention is that these only come in whole sizes and they do not come in wide. I have a wide foot. I can wear them, but a wide would be better for me. If your foot is on the wide side, they have measurements on their website so you may want to check that out prior to ordering. Their selection is pretty awesome. They come in various styles such as Maryland Crab, Red Lobster, Silver Cocktail, Beach, Glamour, Floating, Nautical, Gulf Zebra and many more. Prices for the Tidewater start at about $23.95. They also have other flip flops, by Rockin. Those are really cute too and start around $16.95. I don’t think those have an arch support. So, if you’re looking for comfy, fashionable flip flips at a reasonable price, then check them out. 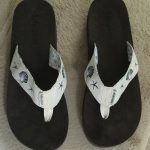 Allabouflipflops.com, my new happy place. CBD Have you tried it? How comfy can you be?